There are naysayers, who claim that writing a novel in just 30 days is a cheap tactic – that the writing that results from National Novel Writing Month is terrible and that it doesn’t encourage good writing. I disagree. Yes, the writing that results from frantically writing 50,000 words in just 30 days can be awful but that is why the next 30 or 60 days that follow NaNoWriMo should be for rewriting, and revising. Once those 50,000 words are finished, the work is not done! That may put you on the right track toward a complete novel, 50,000 words does not a novel make. I agree. I do try to write every day and I believe that A Writer Writes. But many writers know what a difficult goal this can be to attain. NaNoWriMo gives me a goal and a deadline. Does it make me less of a writer to get excited about Nano when I should be writing everyday anyhow? Absolutely not. The excitement of NaNoWriMo reminds me not only why I write but why I need to do it every day. It encourages setting word count goals. 1,677 words a day is not a daily word count goal that typically works for me and my writing routine. In November, I set everything else aside to write as much as possible in order to make that 50,000 word goal. It helps me set my sights higher and learn that I can write 1,700 or even 3,000 words in one day if I really focus and make the time for it. It’s a great method for us writers to get out of our own way and get words onto the page. Writing a novel is an overwhelming, time consuming and – at times – daunting task. With a word count goal and limited time in which to reach it, there isn’t much time to stress over details. Instead, we must plough through and worry about the details later. It allows us to explore an idea or a set of character without taking up too much time. With only 30 days to write a novel, NaNoWriMo is a great time to flesh out that character that has been in the back of your mind for a while or try out that plot you’ve been thinking about but weren’t sure where it would go. Writing quickly allows to explore ideas and see where they take us. When an idea doesn’t work out, I don’t feel too bad at the end of the month for only have spent a few weeks working on it. It feels good to know I tried without wasting months and months of my time. And on the flip side, if you like where the story is going, you have a draft of a novel in the works! It helps us connect with other writers – During November, I know there are a whole lot of other writers out there who are going through the same thing I am and trying to reach the same goals. I love the sense of community NaNo offers, whether it is a virtual community through the NaNo site and social media, or a local community through write-ins. It encourages writing for all one-day novelists NaNoWriMo reinvigorates us writers who are supposedly at this everyday while also invigorating young writers who could be playing video games or perusing Facebook but are instead trying to write 50,000 words in thirty days. Nano encourages people, young and old, to attempt their first novel, regardless of whether it ever gets published. For those who decide to try their hand at writing during National Novel Writing Month, even if they fail or they write 39,543 words of garbage they did something probably few of their friends would even attempt. What are your thoughts about writing a novel in 30 days? Is it worth it or is it just a cheap tactic for wannabe writers? 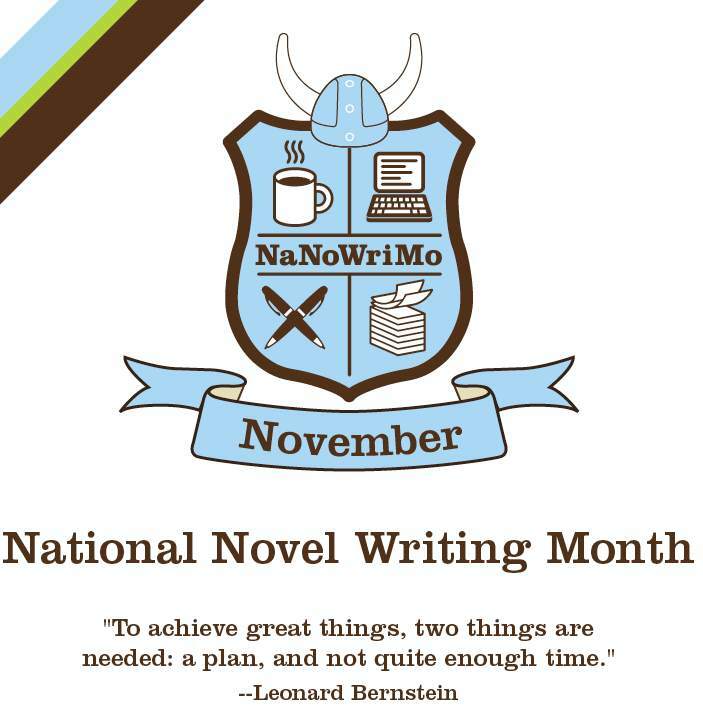 If you will be participating in NaNoWriMo, please comment below! I’d love to hear from you and keep up with how you are doing in November! This entry was tagged Inspiration, NaNoWriMo, National Novel Writing Month, The Writing Process, Writers, Writing tips. Bookmark the permalink. I will be participating in my first NaNo this year. I like the idea of getting 50,000 words down on paper in a month. I know that it will not be ready to publish at the end of November, but I am hoping that I end up with something worth polishing. Glad to hear you will be taking part in NaNo – best of luck! I am a NaNoWriMo Rookie. The idea of writing such a large number of words in one month is exciting, but it is knowing others are doing the same thing that makes it alluring. Connecting with other writers is one of my favorite parts of NaNo – it’s very motivating! Be sure to keep us posted on your progress! I did NaNo in 2010 and it was great for learning discipline in writing every day. It was really difficult to clean up the mess of 50k words that I had afterwards. It was about 30 or 40k from being a first draft. It was really difficult for me to find structure in that huge glob of words, but I think that it was a great experience. I probably won’t ever do it again, but I don’t really need to because I write nearly every day now. I like to take the time to create an outline and then really think about my words. NaNo was a great experience though. It gave me a sense of accomplishment when I finished with 50,006 words on November 30th. I recommend it to anyone who writes but lacks discipline. Just know that you’ll have a lot of work to do afterwards if you intend to try to get it published. I can relate. I find it hard to write 50,000 words of a novel from scratch. The year I won, I used NaNo to finish the first draft of a novel I had already started. It was a great motivator to stop dragging my feet and just finish the darn thing. And reaching that goal is a great sense of accomplishment! Yes indeed! It took me 2 years in total to finish what I started in NaNo (although it could use another looking at if I’m going to ever try to get it published). But it felt great. I feel better prepared to write my second novel. I think NaNoWriMo is a fantastic idea, and the points you’ve outline above are spot on. While I’d love to participate this November, it’s not a good month for me and I know I’d be biting off more than I could chew. A goal I’m toying with right not is to participate in Camp NaNo next July, a much better time of year for me. In the meantime, I’ve got lots of time to hammer out a solid outline for my novel rewrite! Just tweeted a link to this post. Love it! November does seem a strange month for such a challenge, I always thought January would be a better time, in the dead of winter with no upcoming holidays! Camp NaNo is a great idea, be sure to let us know how it goes. Happy writing and thanks for sharing this post!